We were originally planning on getting married in Dave’s parents garden up in the Peak District, we rather fancied hiring a yurt. Their garden is on a bit of a slope and so the yurt planners needed to come to their house to determine if it was even feasible. 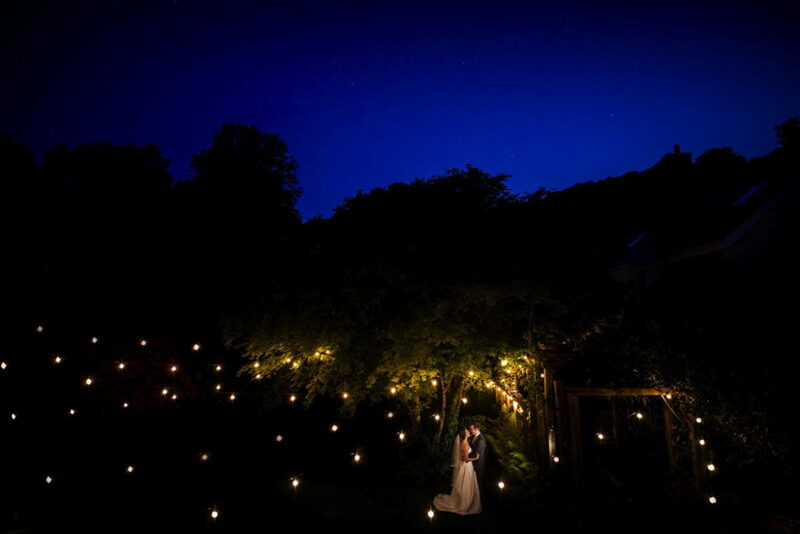 We thought to look online for venues in our local area so that we could get an idea of what else was out there, just incase the yurt company said it was impossible. After an internet search we came across Lower Grenofen and decided to book a viewing as the website made it look idyllic! 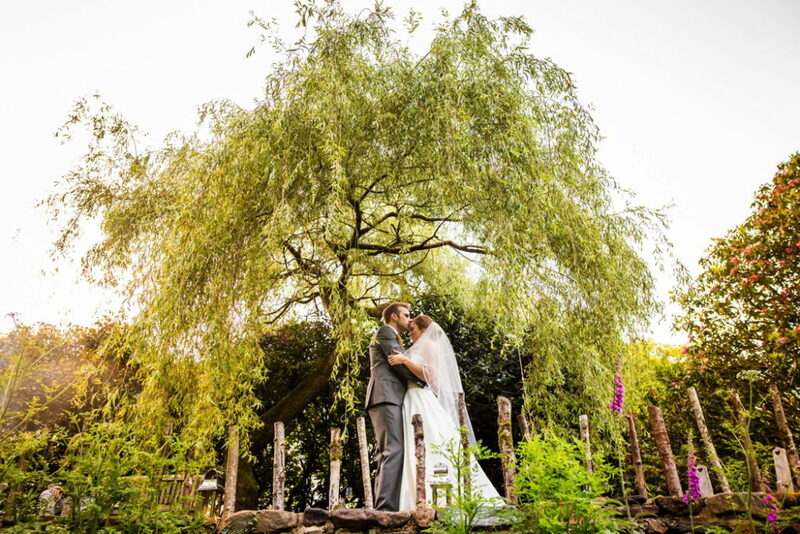 From the moment we arrived, met Nicola and looked around the venue with it’s beautiful layout, gorgeous flowerbeds, intimate ‘at home’ feel and wonderland river walk we knew we wanted to get married there. We cancelled the yurt viewing all together and confirmed the date for our wedding with Nicola there and then. 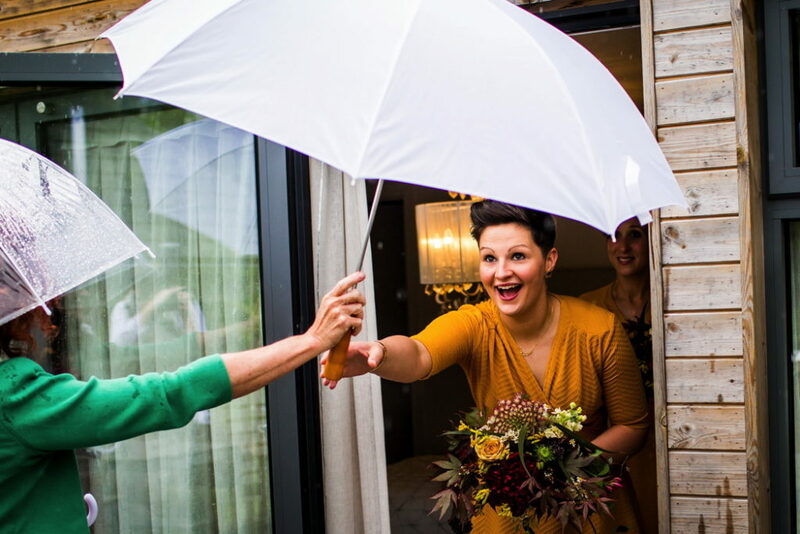 We had both said we didn’t want to get married somewhere that felt like it ‘churns out weddings’ and there is no way that Lower Grenofen could be said to feel like that. 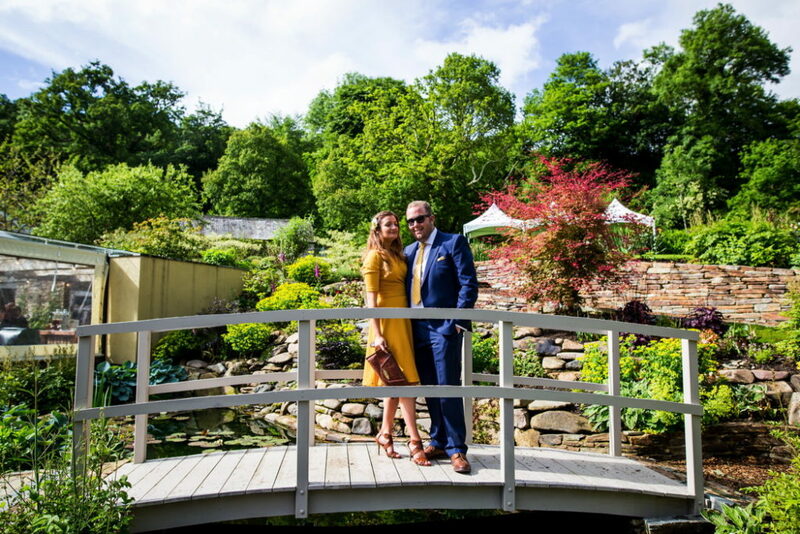 It’s a home first and foremost and it feels like one, the venue and the wedding that the team there gave us was personal and beautiful in every way. 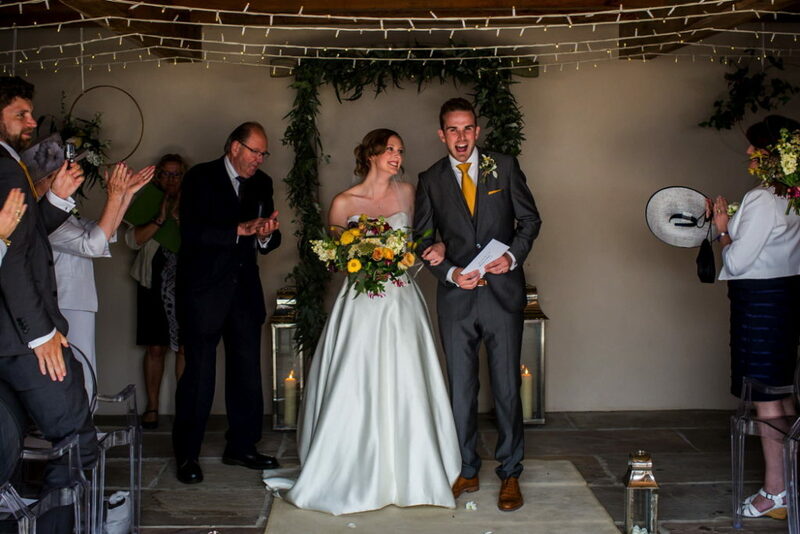 My dress was by Augusta Jones from Clifton Brides in Bristol. I went along to the boutique with my mum and Louise one of my maid of honours (I greedily had two). I thought I wanted an embellished dress with lots of lace, certainly not a strapless, satin gown which is what I bought! My mum selected it and insisted I tried it on (even though it was not the style I was looking for). 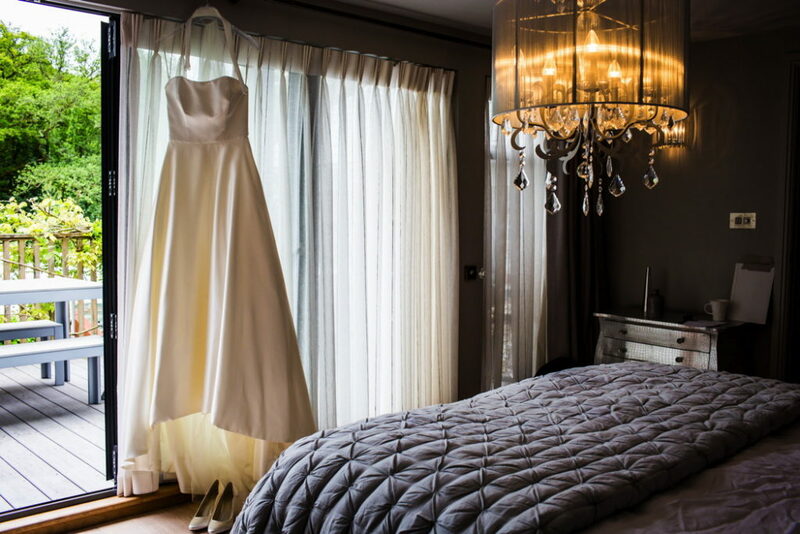 It was the second dress I had ever tried on and the tears flowed from all three of us when I came out of the dressing room wearing it, I couldn’t have felt more beautiful. To top it off after having decided on the dress, when putting in the order the woman in the shop told us it was called their ‘Nina’ dress as they give all of their dresses female names. 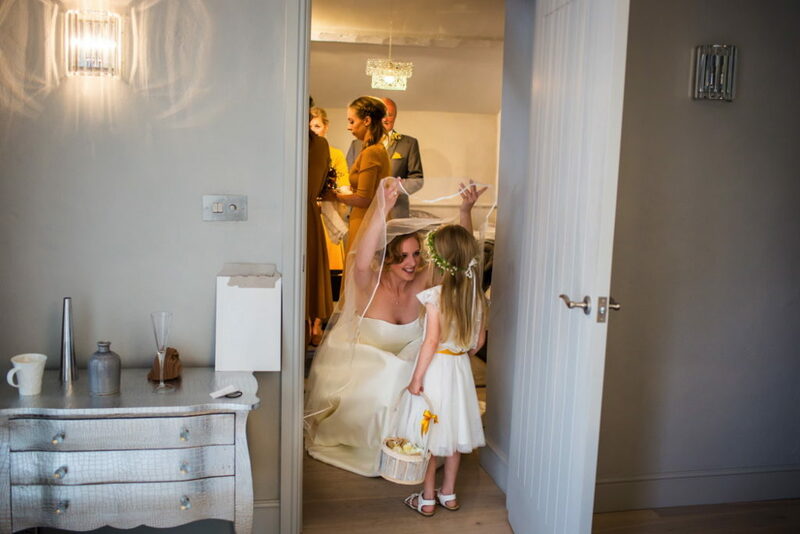 That just confirmed for me then that it was the dress for me – my grandmother on my mother’s side, who lived with us from the time I was a baby and whom we sadly lost a few years ago, was called Nina. 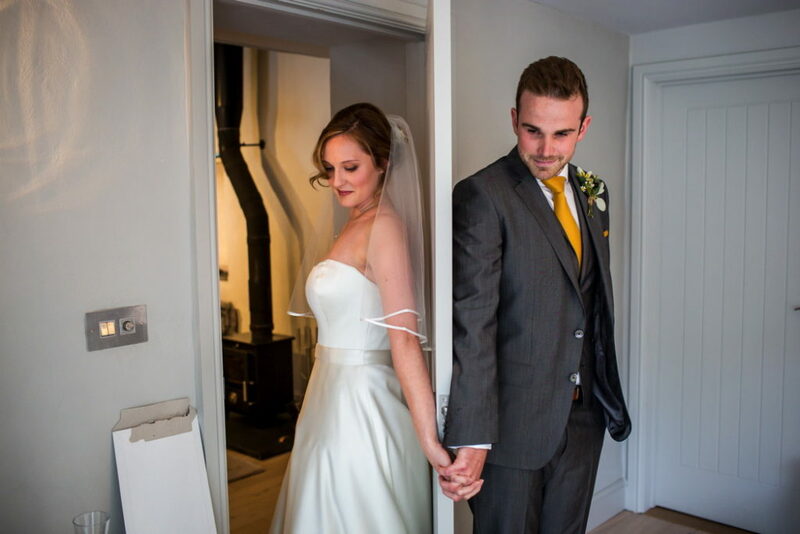 To compliment the dress I chose a shoulder length veil with satin trim, a simple drop pearl necklace from Silverado in Brighton and matching pearl earrings from Number Ten Jewellers. This is where Dave bought my engagement ring and where we then bought our wedding bands. I didn’t want to embellish too much with accessories as my dress was so simple and classic, to me nothing says classic quite like pearls. My shoes were from Rainbow Club, nothing too fancy as I figured they weren’t going to be seen under the big dress! I chose them as they offer free shoe dying after your wedding which meant I can wear them again. 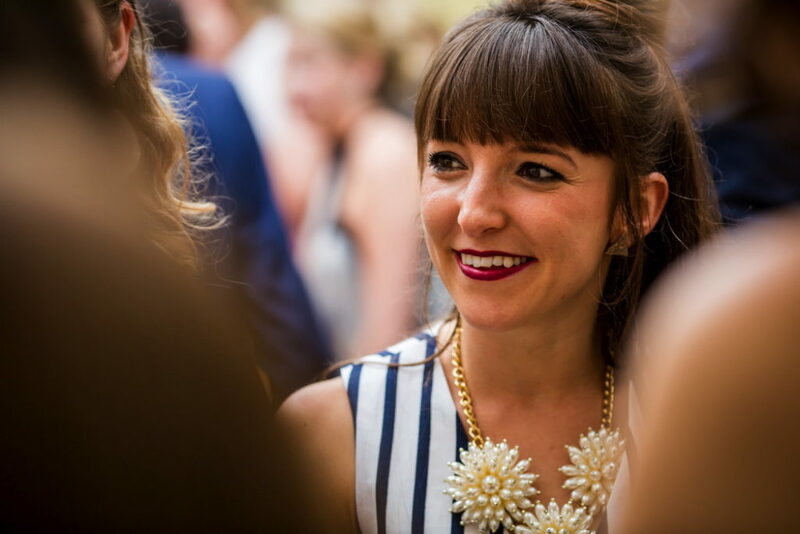 I found Nicola online and arranged a Hair & Makeup trial with her back in January. She really understood exactly what I was after and truly listened to what I wanted. 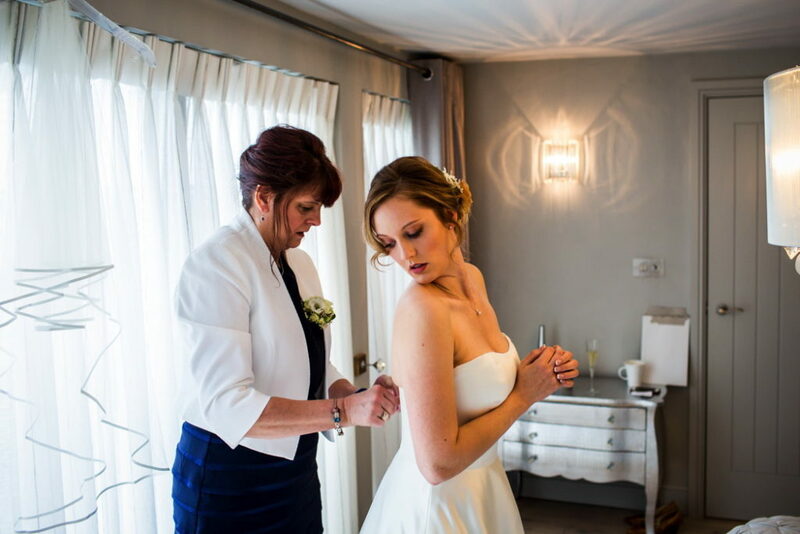 She did my hair and makeup as well as my bridesmaids’ and mum’s hair. For my hair I wanted something fairly loose but up, again I felt that less was more and up would show off the neckline of my gown. 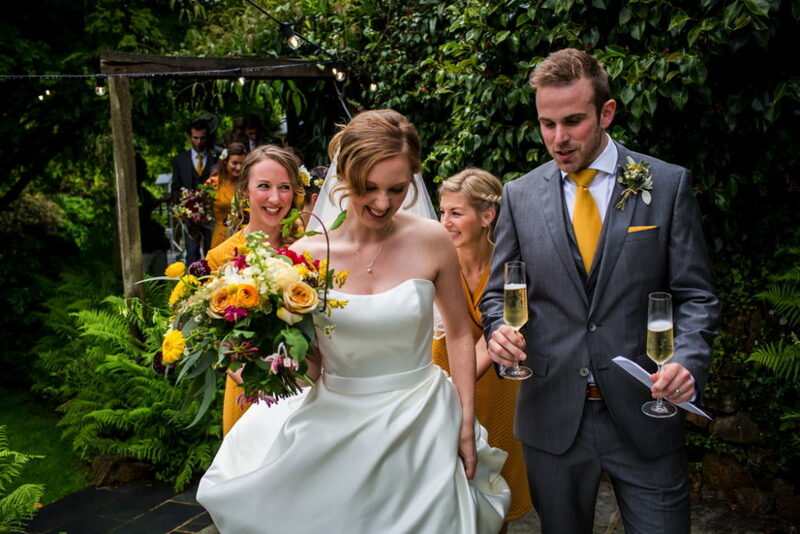 I wanted fresh flowers to compliment the bouquets and to tie in the colour theme we had chosen. With regard to my make-up, I couldn’t have wished for Nicola to do more, it was flattering yet natural. She succeeded in making me feel beautiful without being ‘too made up’. 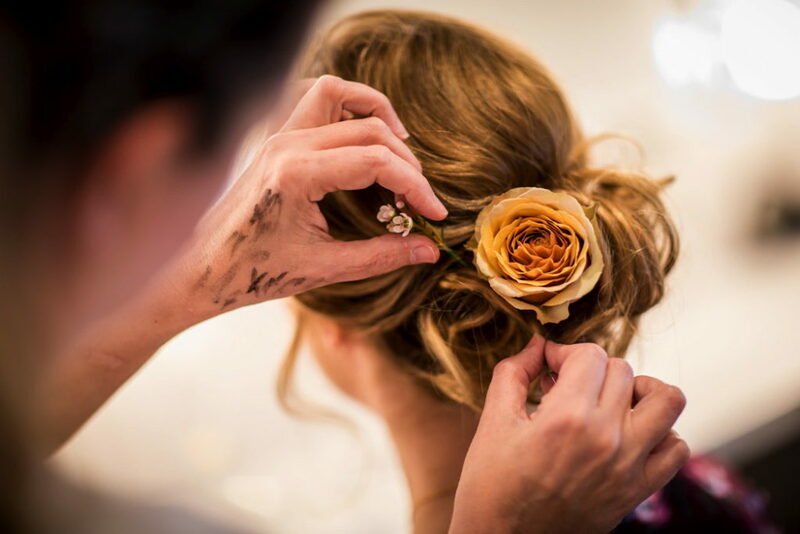 I wanted to feel like me on our wedding day and not like I was trying to be something I’m not. 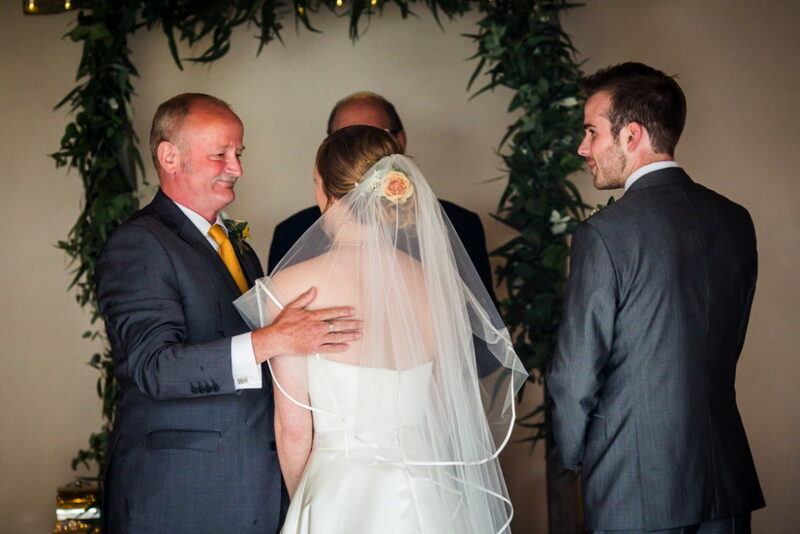 I wanted Dave to see me walking down the aisle towards him, not a revised version. 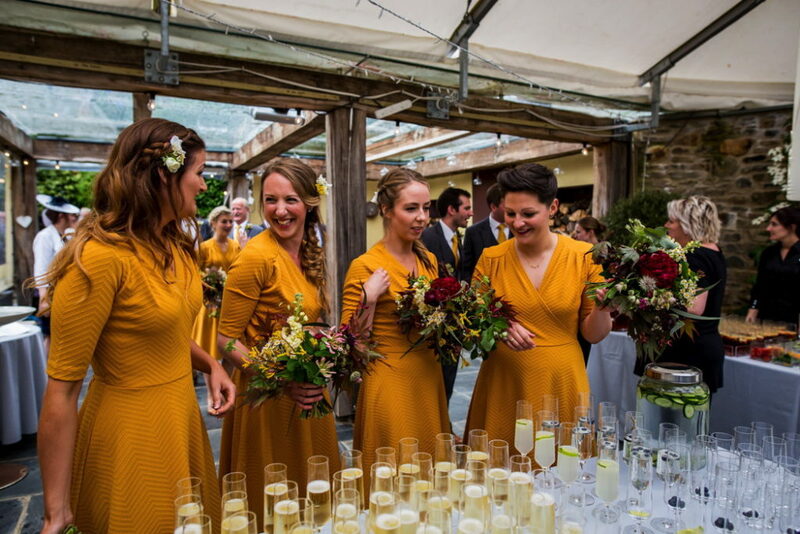 We sort of stumbled onto our fashion choices for our bridal party – well the colour palette at least. I came across a picture of a girl wearing a burgundy skirt and mustard yellow blouse, very casual not a wedding picture by any means, but the colours just popped. Dave and I didn’t want a classically elegant colour choice we wanted a bit of colour, a bit of our personality to come through in the design of the day. Once we had seen this colour combo, mustard yellow and burgundy, neither of us could think of anything else. 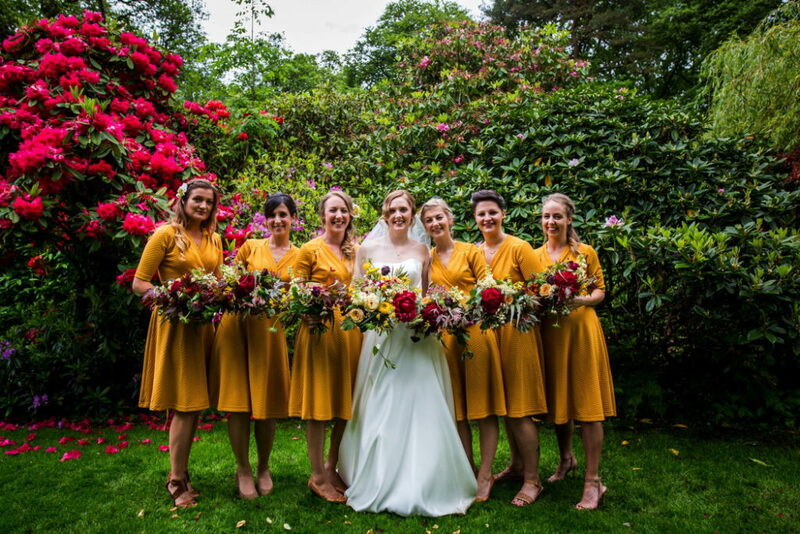 I decided on bright summery mustard yellow dresses for my bridesmaids and after some searching found the perfect ones on an American site called Shabby Apple. I couldn’t order a fabric swatch or anything and after the outrageous customs tax I had to pay to get the dresses to the UK returning them wasn’t an appealing option. I was overwhelmed to find that they were exactly what we wanted and that they all fit! 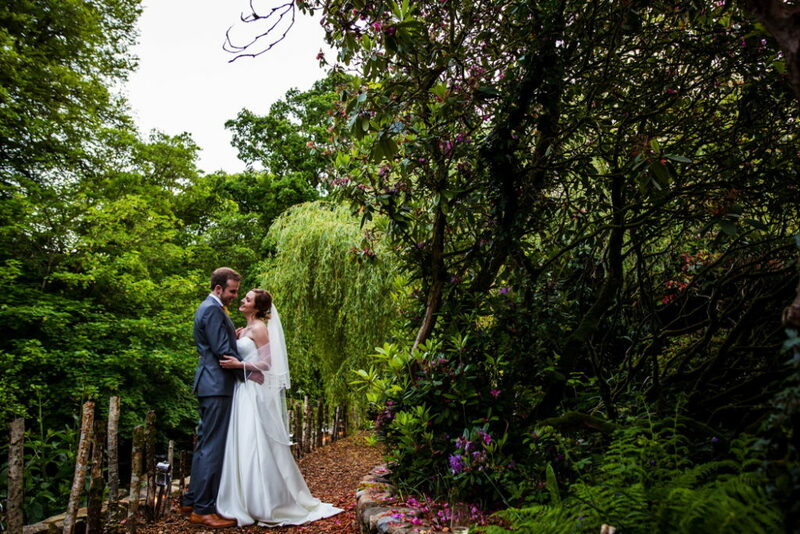 We were keen to get something relaxed to match the beautiful English garden setting and couldn’t have been happier with our selection. 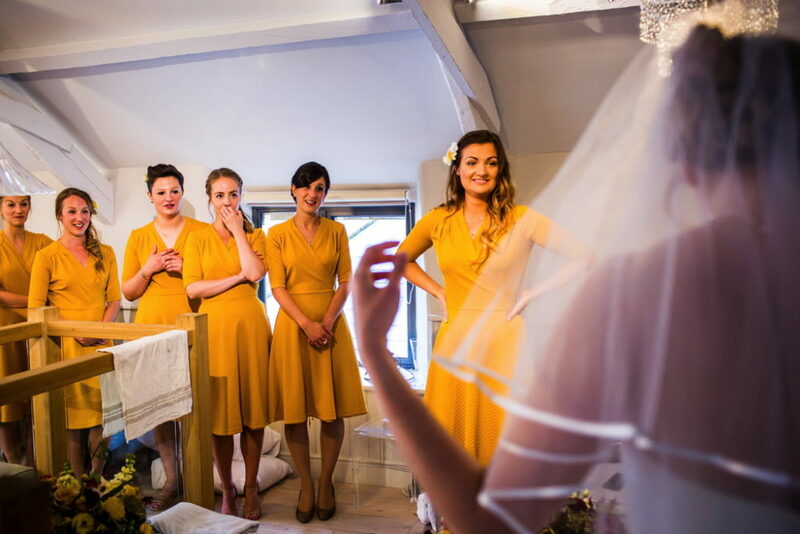 I had six bridesmaids all of different sizes and personal styles so it was hard to find a dress that fitted all. 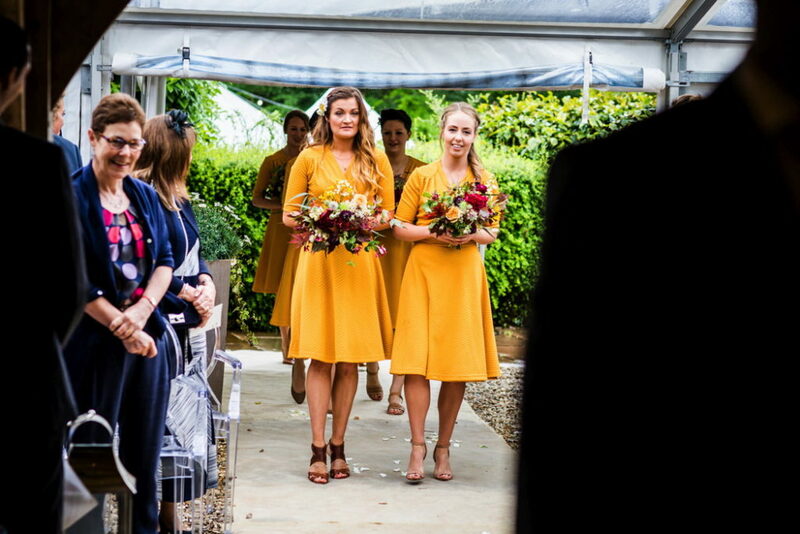 I was originally keen to have my bridesmaids pick their own individual dresses in what ever style they wanted but after deciding on mustard yellow, with all the different possible shades, it seemed safer to try and choose one that suited them all and that they (so they told me) all liked. 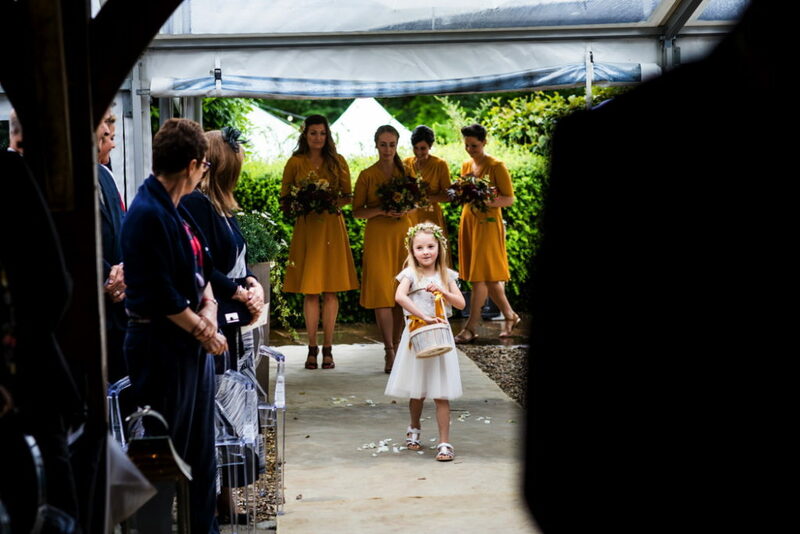 Our flower girl was my 5 year old Niece who’s dress we bought from Monsoon and later found a mustard yellow ribbon, the same shade as the bridesmaids dresses, for her to tie around her waist. 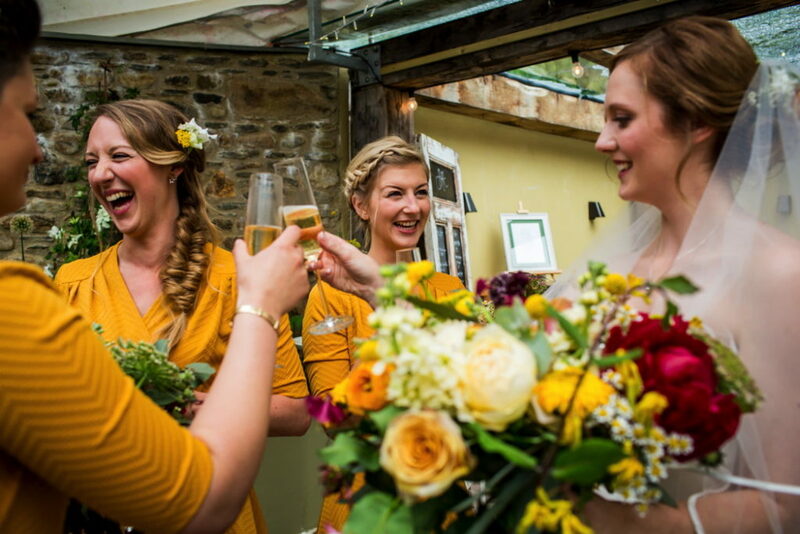 Nicola did most of the bridesmaids’ hair and they chose their own hairstyles in whichever style they felt comfortable, we added fresh flowers. 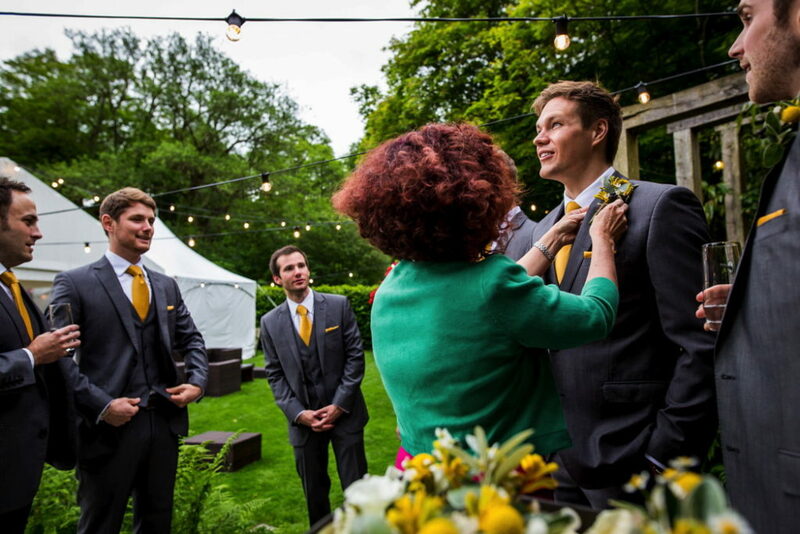 Once having decided on mustard yellow with hints of burgundy (groomsmen’s socks, peonies in the bouquets) a light grey suit for the groomsmen and groom complimented the bold colours. Dave very much styled himself. He and his dad went to London for a ‘boys weekend’ where they went suit shopping in between watching rugby and eating steak. The suit Dave bought was from Hugo Boss. He and his dad were both keen for a 3-piece suit as it’s not often you get the occasion to wear one. 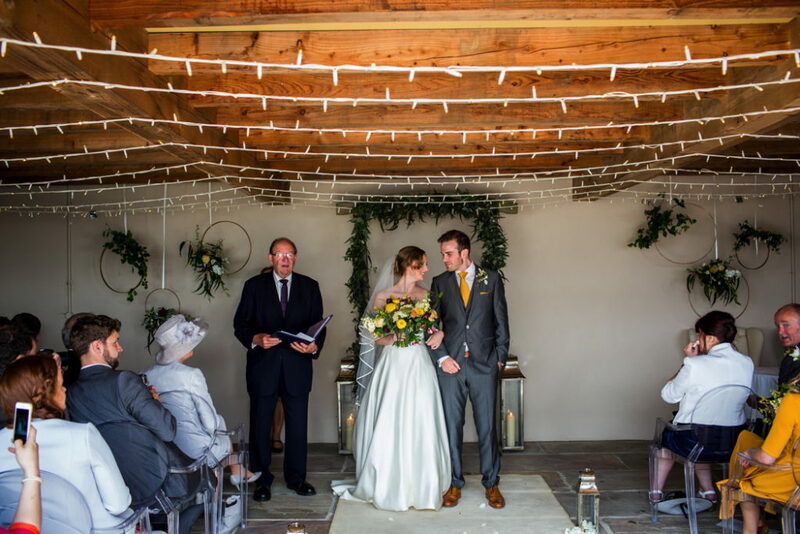 Being June we were hoping for some sun so whilst a tweed/woven wool fabric was originally what we were thinking to fit the rustic style we were going for Dave settled on a handsome wool-silk blend that was lighter and much more sensible given the month and location. He paired this with some beautiful brown brogues, brown belt, burgundy socks, mustard tie and pocket square. 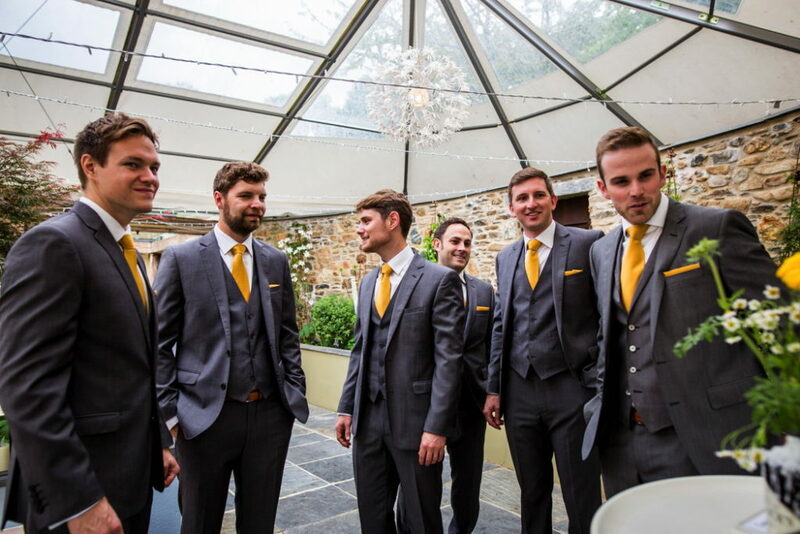 His groomsmen wore very similar 3-piece suits from Moss Bros, their own brown shoes and tie/pocket square/socks to match Dave. 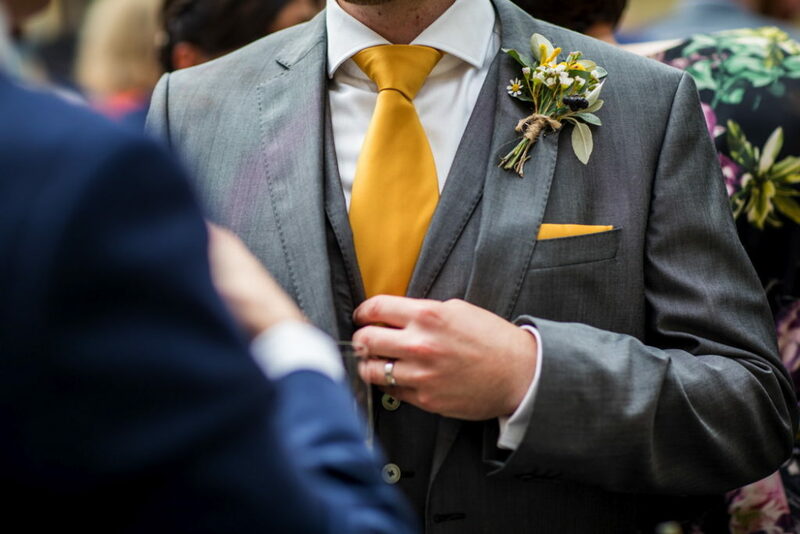 As part of his gifts to his groomsmen Dave bought them all personalised cufflinks for the day which were matched to their personality/hobbies which finished off their look perfectly. I’ve already mentioned the main style for the day I suppose – rustic, relaxed, colourful and gin-based! 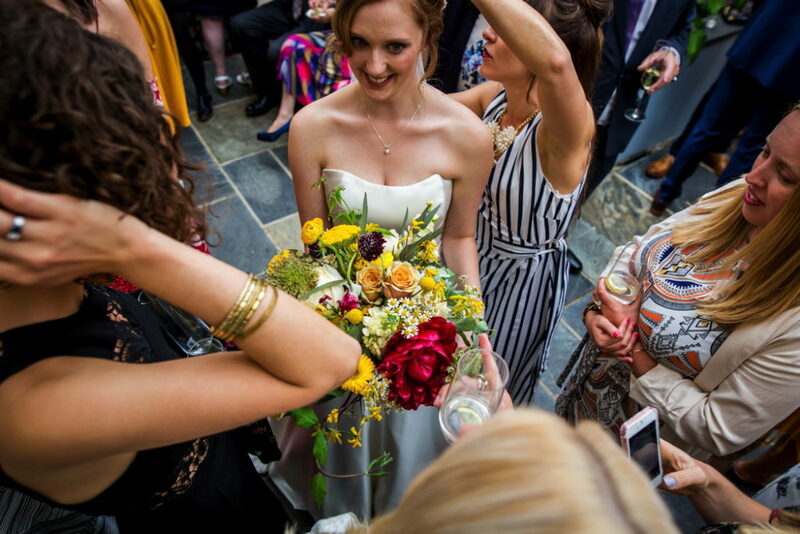 The main feel we wanted, particularly for our ceremony, was informal. We wanted people to feel comfortable enough to cheer or clap during the ceremony if they wanted to and for us to enjoy it. 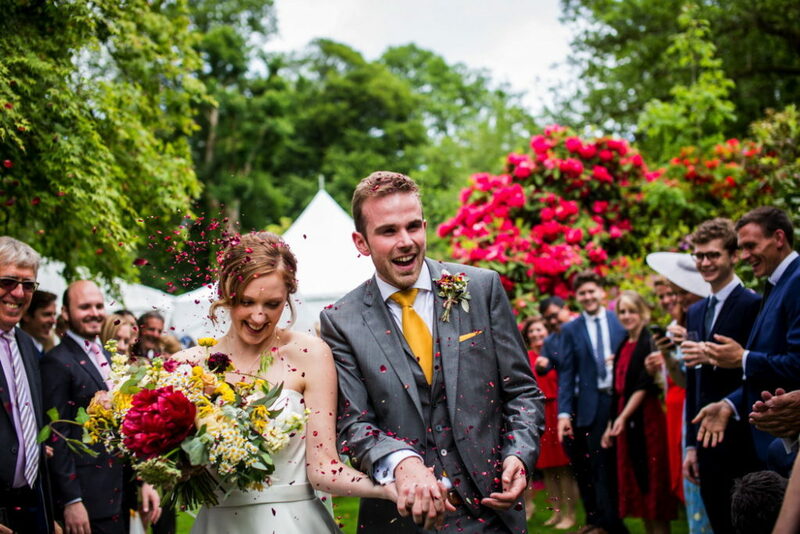 My brother played an acoustic guitar version of one of our favourite songs – Romeo and Juliet by Dire Straits – for me to walk down the aisle to which completed the personal, romantic and simple style we were hoping for for our ceremony. 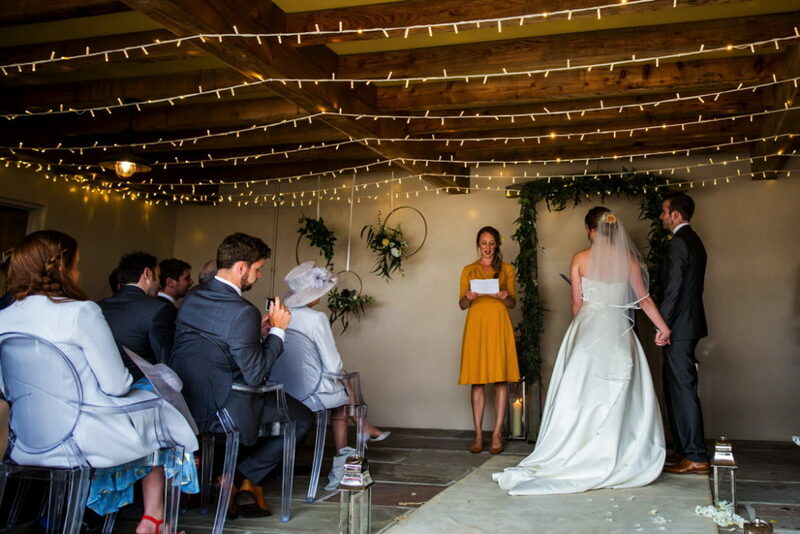 Our Order of Ceremony cards hopefully helped set the tone of the ceremony as they simply stated ‘music starts, we get married, everybody parties’ we were keen not to get too weighed down in the fine order of things. 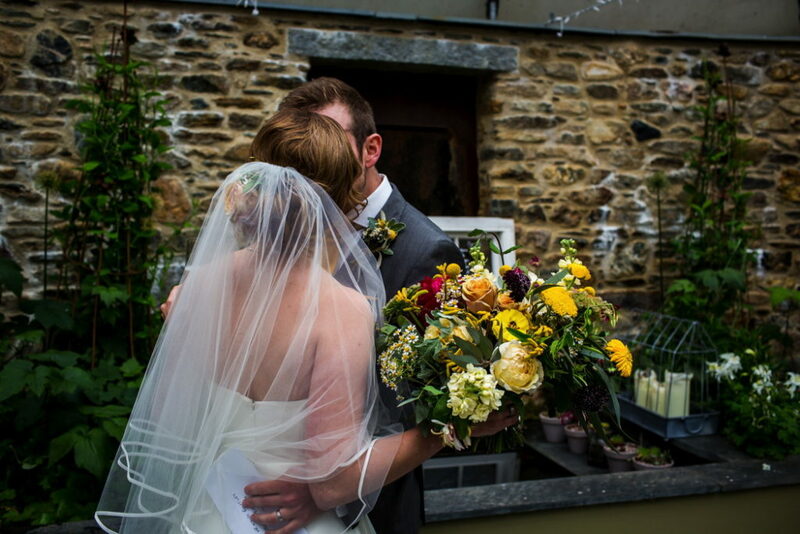 Deborah Morris of Dartmoor Flowers was our florist, recommended to us by Nicola of Lower Grenofen. 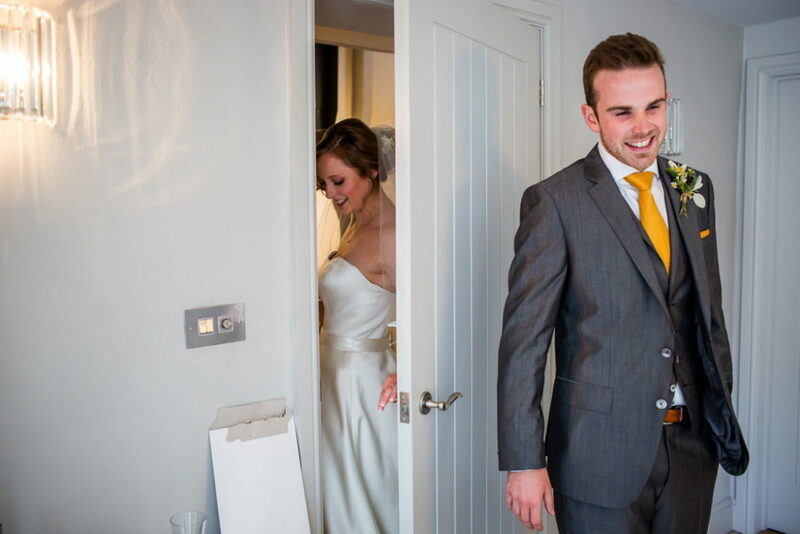 Dave and I got engaged back in 2015 prior to moving to New Zealand for a year, this meant that a lot of our supplier finding was done online and the first year and a half of contact we had with Deborah was via email. 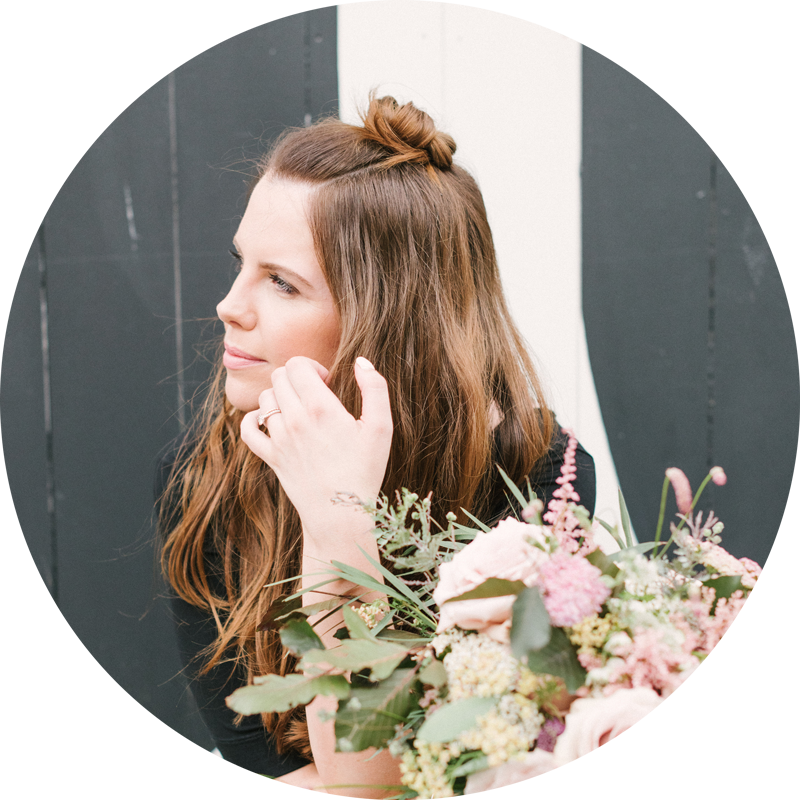 It was clear from the first few emails that Deborah was an artist and had so much to offer to the styling of our big day. 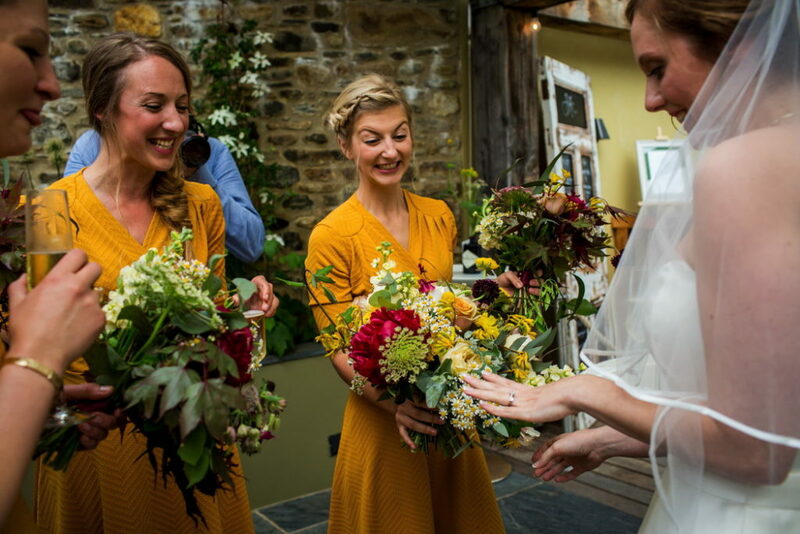 She was thrilled with the colour choice we had selected and suggested some really beautiful flowers, our favourites of which were the craspedias and huge burgundy peonies that we had in our bouquets and on our wedding cake. On our return from New Zealand we met up with Deborah at her house in Devon and went through some ideas and finalised what we were after. 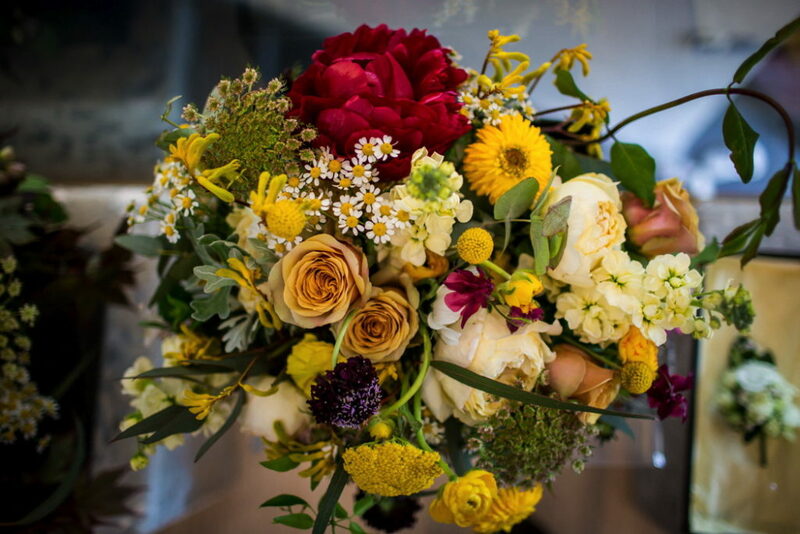 Dave and I left her house with complete confidence that Deborah was going to deliver us some truly outstanding flowers – and we were not disappointed. 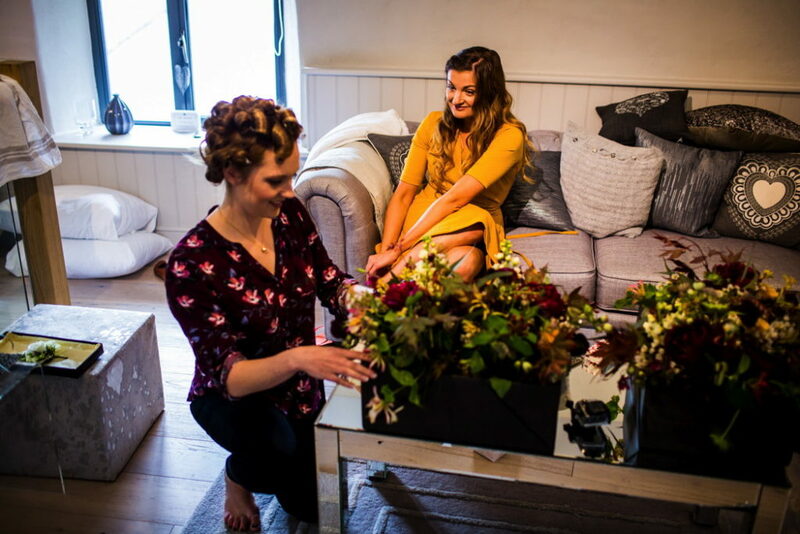 It was lovely to discuss our ideas and have her put her artistic eye to our vague thoughts to produce absolutely stunning floral arrangements. 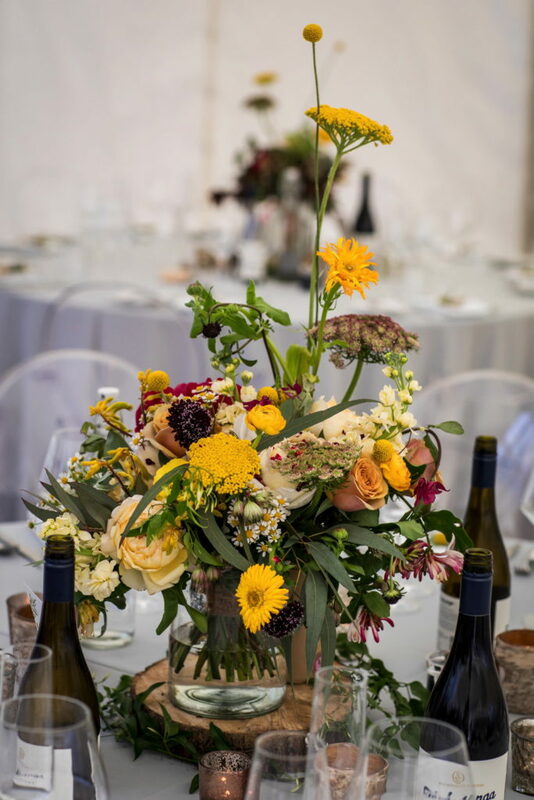 We went for a few tall stemmed flowers in the craft gin bottles as our centre pieces with running ivy and honeysuckle surrounding it. 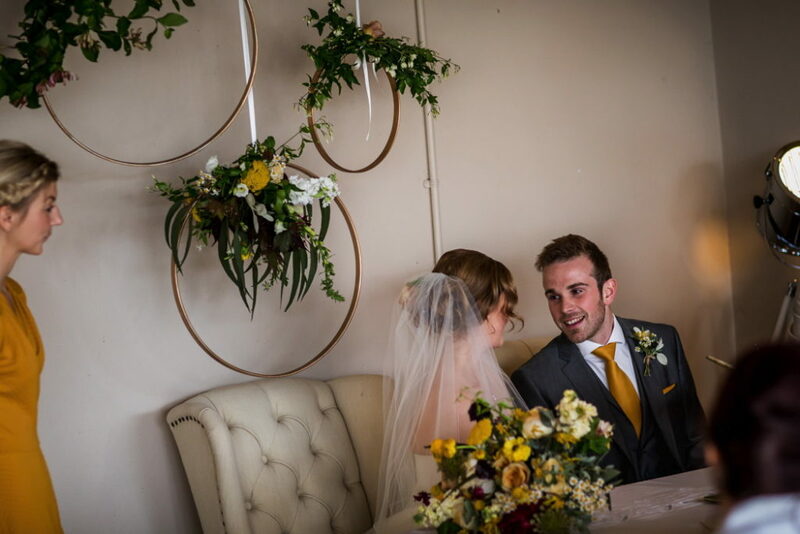 Our favourite floral pieces were the foliage and flower hoops that Deborah made us for the ceremony barn that were then later moved into the marquee for the reception. We are planning on trying to recreate them with artificial flowers to hang in our house as we loved them so much. 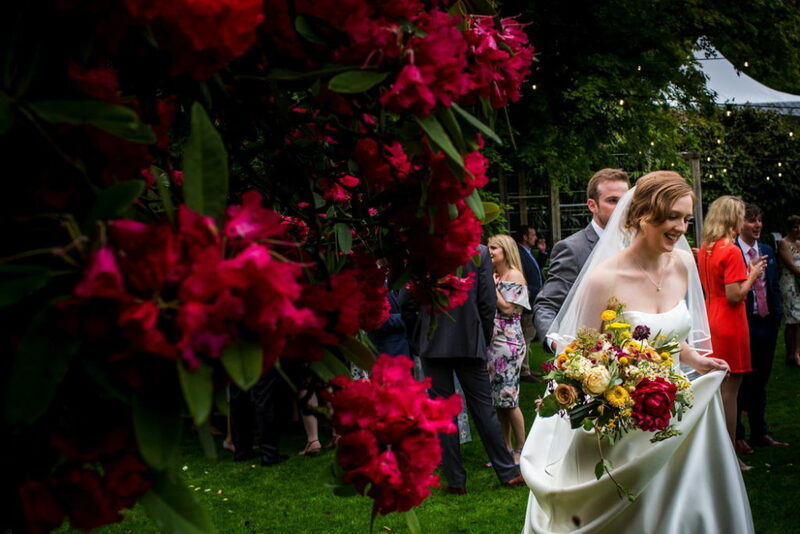 As there was so much mustard yellow around, what with the bridesmaids dresses and groomsmen ties, we were keen to have burgundy in the bouquets, the peonies were the pièce de résistance in our opinion and we loved them. Our cake was by Lindy Foster of Posh Cakes in Devon. Again we found her online following a recommendation from Nicola and discussed our (extreme) love for cake via email. When we were back in the UK we went to Lindy’s house in Devon and had an extensive cake tasting (tough work but someone had to do it…) we settled on four different flavours: victoria sponge (my favourite), coffee and walnut (Dave’s favourite), passionfruit (New Zealand classic dessert flavour) and Gin and Tonic (of course). Again we wanted to keep the appearance simple and Deborah provided some more beautiful blooms to decorate the 4-tiered semi-naked cake. We also had a 5 tiered cheese cake from The West Country Cheese Co. who went above and beyond to provide us with the perfect cheese for the day, decorated with two little standing mice for an extra finish. 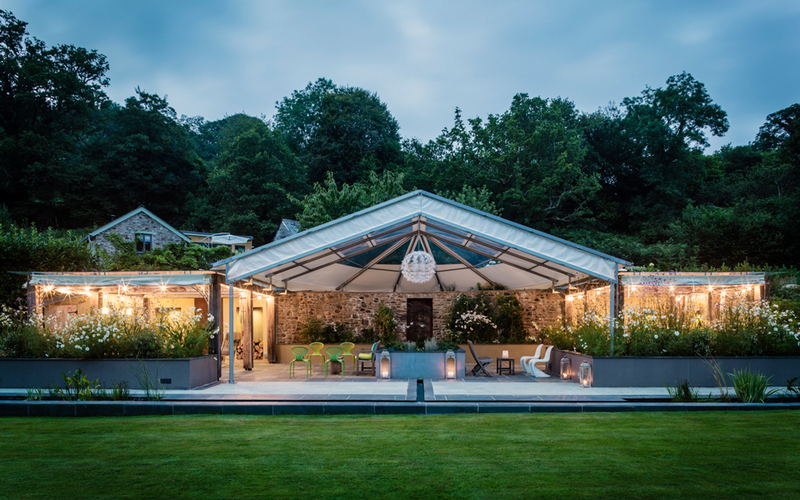 The Outside Inn catering company is linked to Lower Grenofen and is the exclusive caterer for the venue. 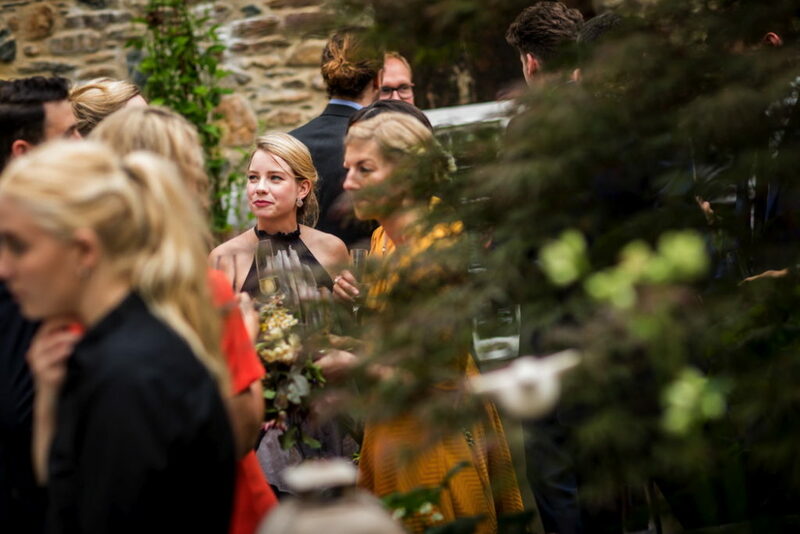 We initially wondered if we wanted to be locked in to the option of only one caterer but after discussing our ideas with the team and going for a tasting, all our concerns were thrown aside. We had simple Afternoon Tea style canapés to fit in with the garden setting followed by a menu which gave guests a choice of 3 starters and 3 mains. 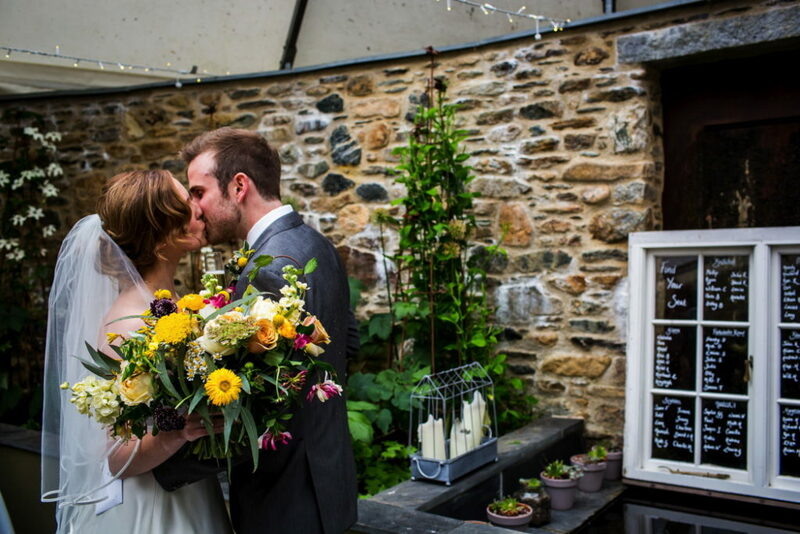 We are both big foodies and so wanted food that you wouldn’t normally expect to see on a wedding menu. 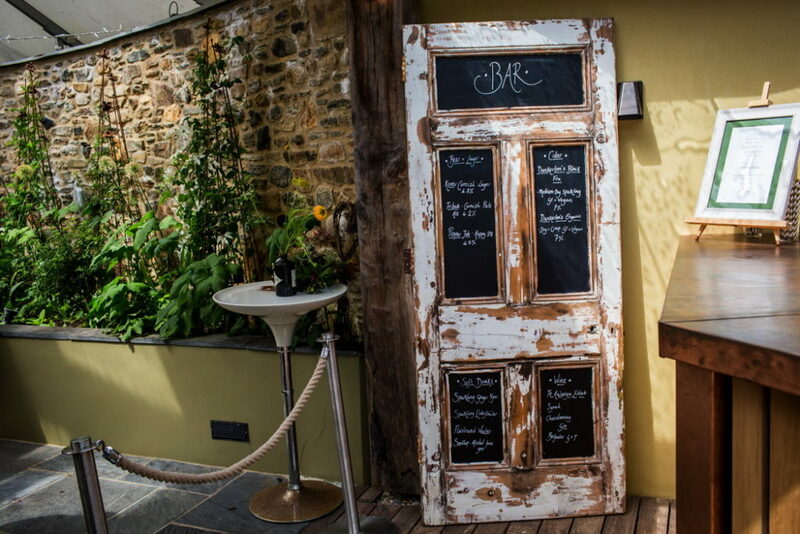 Our favourites were the chilled watercress soup with white crab meat, lemon sole with lobster sauce and the Devon Ruby Beef rib tip with clotted cream mash. 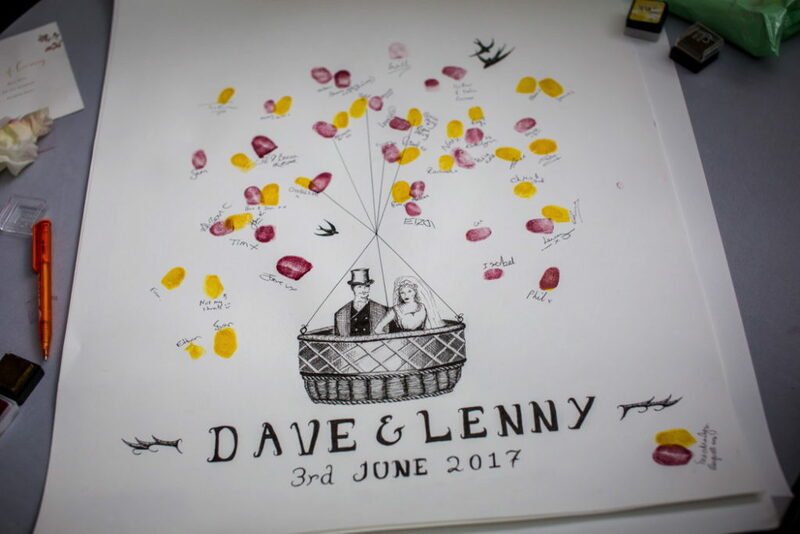 The lemon sole was something we were really passionate about having on the menu as in a bizarre twist whilst Dave was proposing in our garden in Plymouth a seagull dropped a live lemon sole into the middle of our romantic candle-lit dinner! 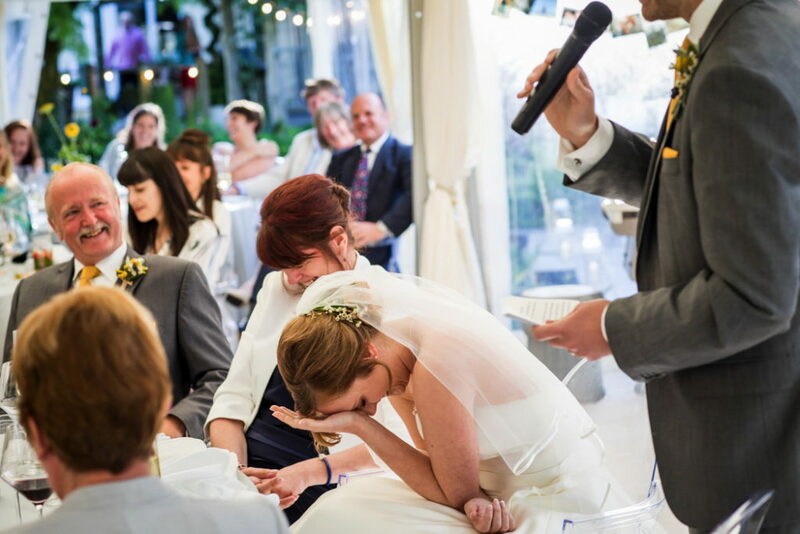 It was beyond hilarious and given the timing we felt we had to then serve the fish at our wedding (needless to say we kept the lemon sole the seagull had so kindly donated and ate it later). 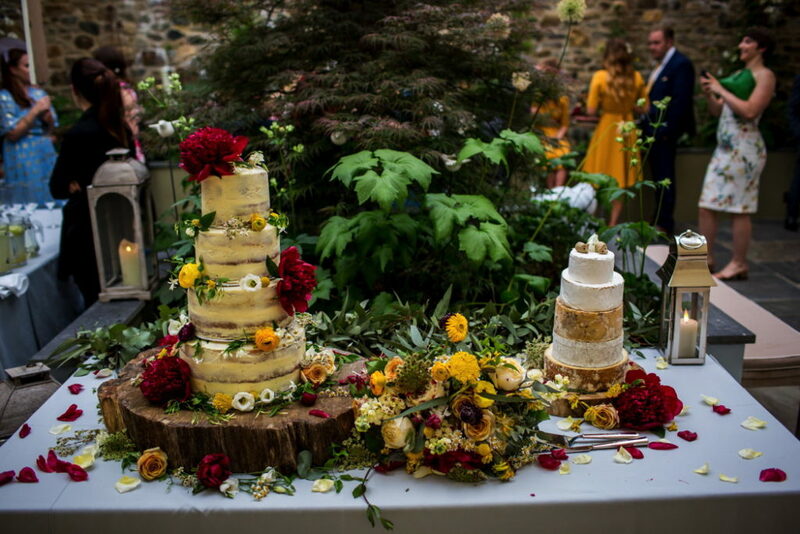 The wedding breakfast was topped off with a dessert table – five of our favourite, most english desserts in miniature for everyone to help themselves to – heaven. We hand selected the wines ourselves whilst out in New Zealand – we wanted to bring a bit of our time there to the day. So whilst living out there we ‘painstakingly’ went to vineyard after vineyard trying glass after glass (bottle) of different wines until we found our perfect white and red from Te Awanga in Hawkes Bay and sparkling from Hunters. 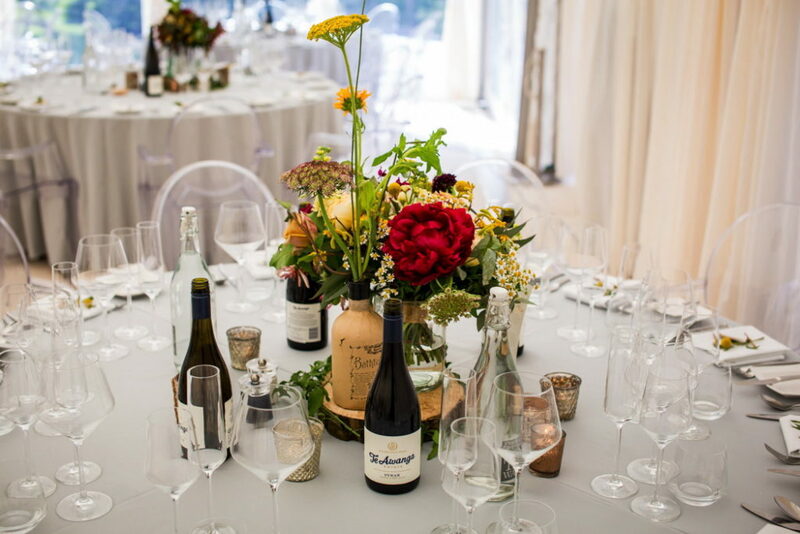 We were astounded to find that the only UK supplier that could get us our wine was located just down the road from our venue in Tavistock, Steevenson Wines were great and made our wish to have New Zealand wines that we had selected at our wedding a reality. 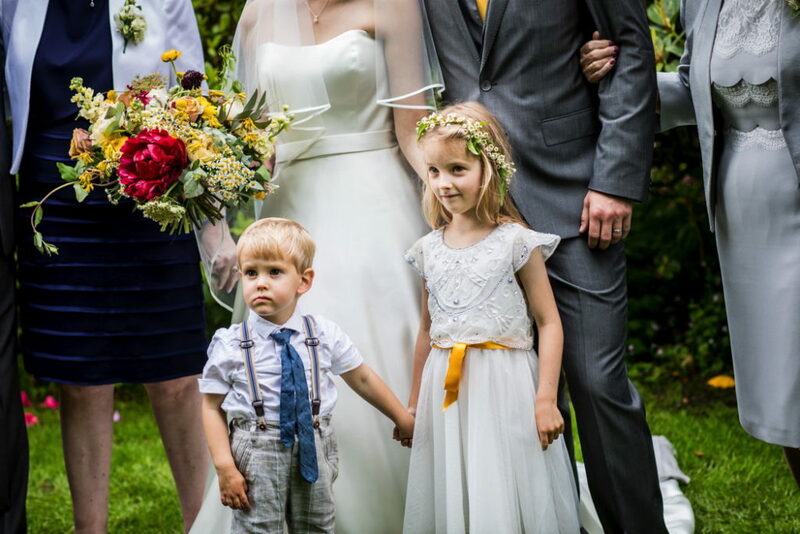 We were lucky enough to find Luna Weddings online who came as Anna and Mike Poole, the dynamic married duo who captured our wedding in the most incredible ways. They were such a joy to be around and from the moment we met them for our engagement shoot on baggy point in Devon we knew we had chosen well. 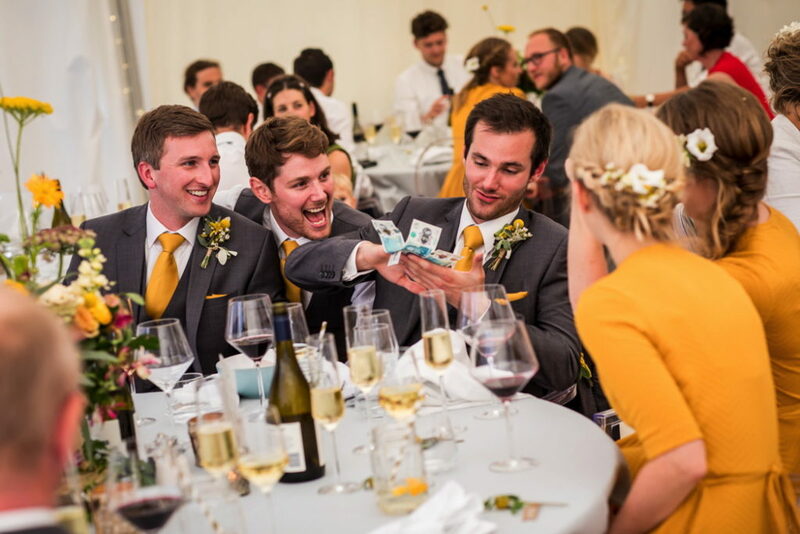 They fitted right in with our wedding guests, adding to the entertainment and the joy of the whole day. 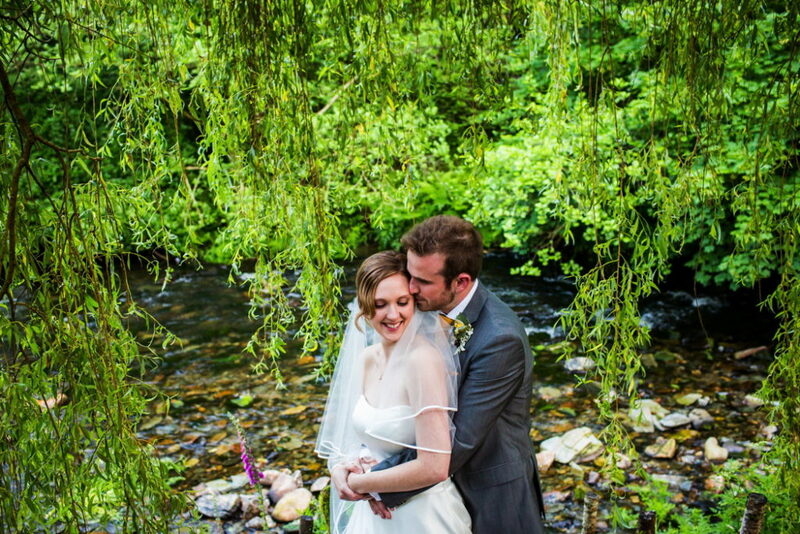 They went above and beyond what we had expected of our photographers, Anna at one point scaled the building and photographed us from the roof whilst Mike rolled up his trousers and (cameras and all) clambered into the river to get us a fantastic shot within the leafy boughs of a willow tree. 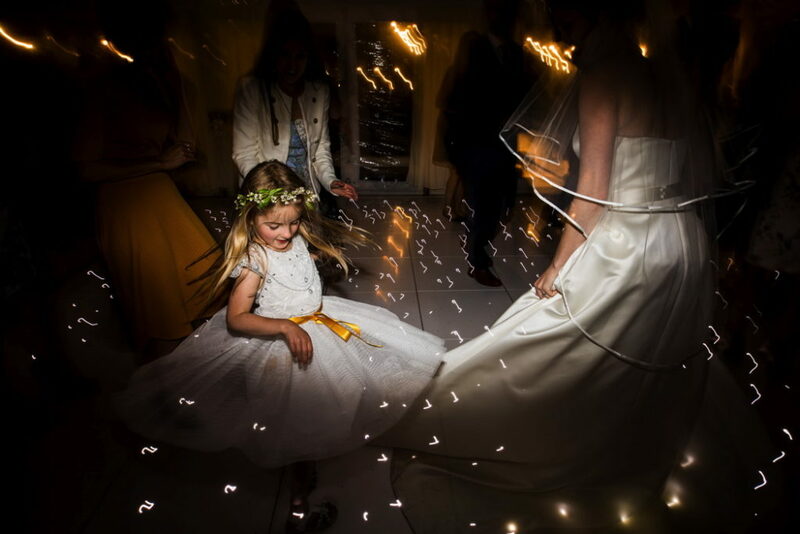 Their photographs captured of all those special little moments that happen at a wedding have frozen those memories in time for us. 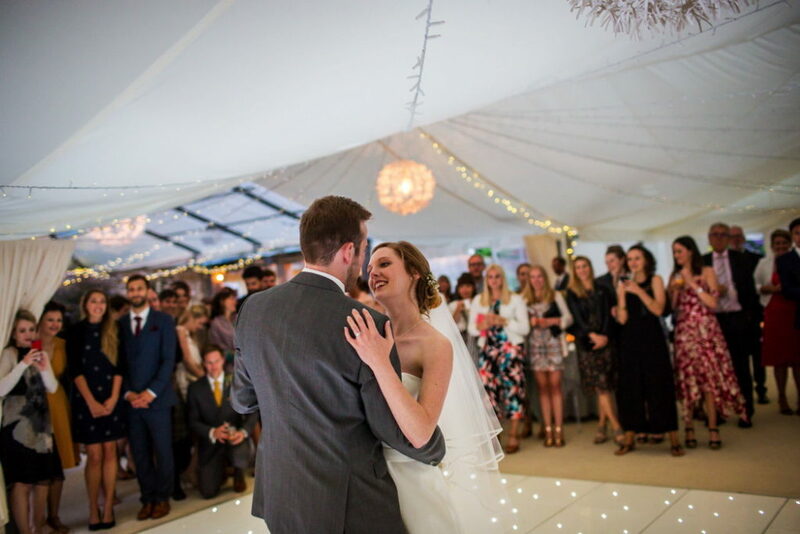 At your wedding you’re obviously trying to see everyone and experience everything and you miss a lot of the little nuances that make a wedding special – Anna and Mike recorded those for us in beautiful ways and we will be forever thank full for the gift they have given us. It’s so hard to choose just one. The ceremony was the highlight for us both, not being religious we were mostly thinking about the huge party after the marriage but after doing the ceremony and making the vows to each other we just wanted to do it again! 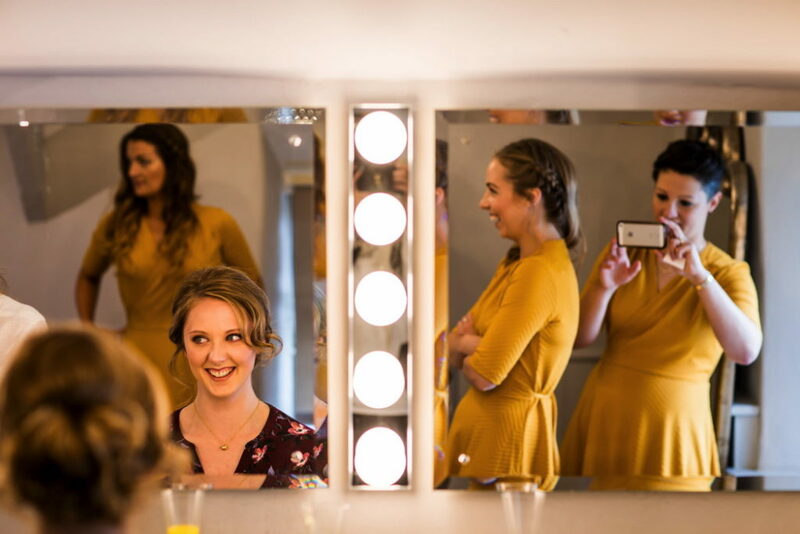 For me getting ready with my bridesmaids and mum was very special and something I will always remember with a smile. 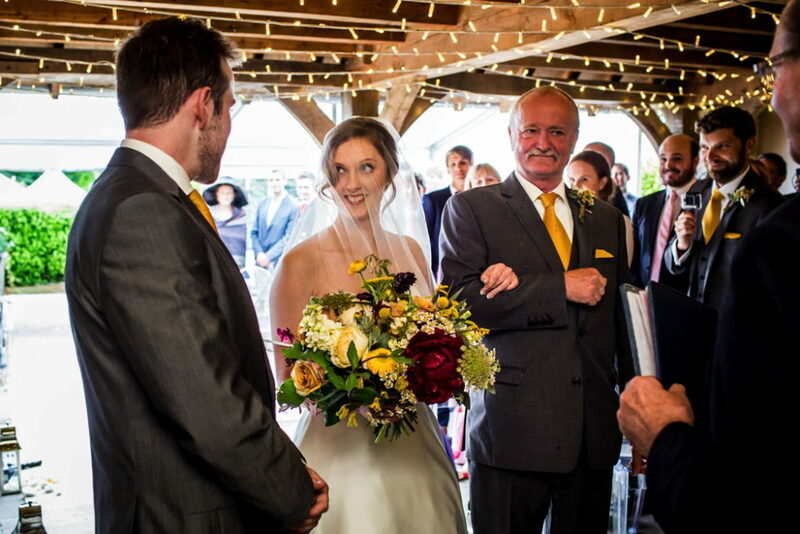 My dad’s face when he saw me for the first time on arriving to pick me up to walk me down the aisle will also stay with me forever. 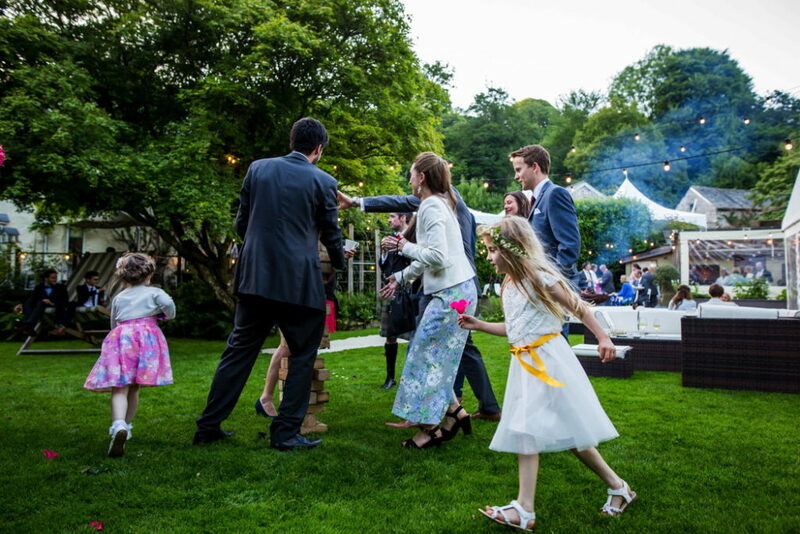 Dancing and partying with our friends and family was so much fun, the atmosphere of the whole day was fantastic and just having everyone we loved in the same place at the same time was pure magic. 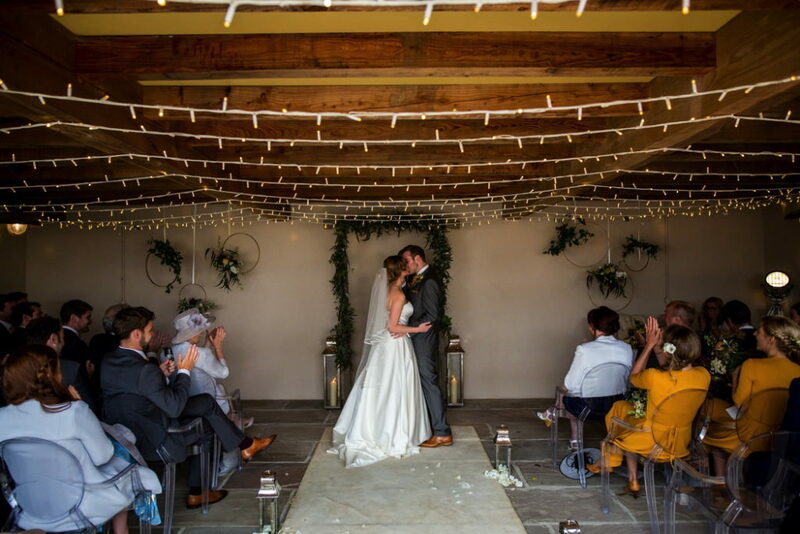 After the final guests had departed, Dave and I were left by ourselves in front of the fire in the reception marquee and were able to reflect quietly on the day and remember everything that had happened – a really lovely part of the whole experience. Savour it. 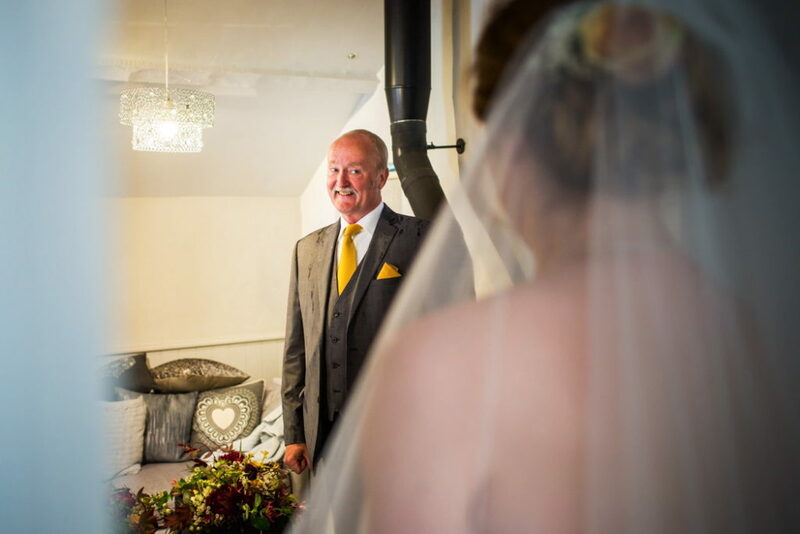 Dave and I had two years to plan the wedding and loved having that time together to imagine and think, it brought us closer and the long planning period took away any stress there could have been with preparing for a wedding. 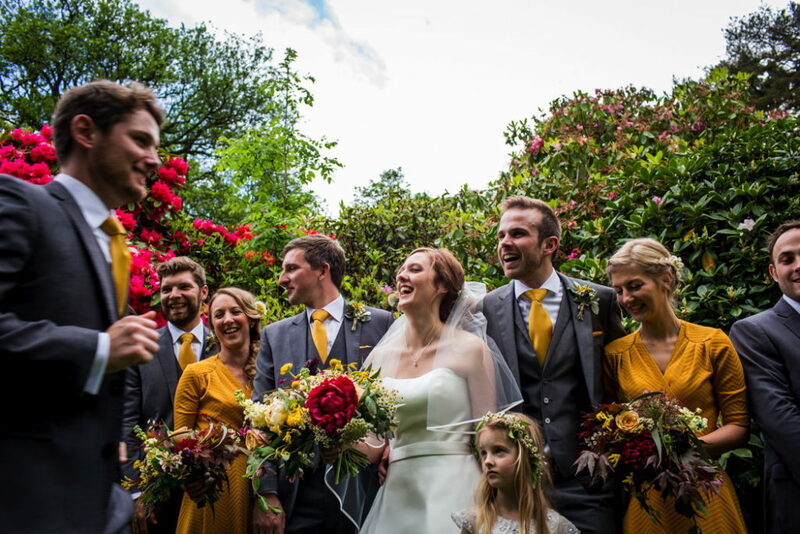 We’re both fairly laid back and for us the important part of our wedding day was to get married and have our friends and family there to see it, the finer details in the end don’t matter and we tried to keep that perspective throughout the run up. During the day take time to stop and appreciate what is going on around you – everyone is there to celebrate you as a couple, it’s a wonderful feeling to realise you are so loved, enjoy it and delight in it together.